Even as sales have moderated sharply in the world’s second largest motorcycle market, demand for scooters has grown in strong double digits between April and August this financial year. The robust growth rates the segment has posted over the last five years have evoked renewed interest among two-wheeler manufacturers who are introducing new products to tap into the category. While Piaggio drove in the iconic Vespa targeting consumers at the upper end of the price spectrum, Hero MotoCorp launched the Maestro for the urban male customer earlier this year. The latest in the fray is Japanese auto major Yamaha Motor Corporation (YMC), who with the Ray now hopes to stir the young female buyer. The scooter category, which accounted for about 11 per cent of total demand at approximately 9,00,000 units in 2006, has grown rapidly over the last five years to reach about 18 per cent of the total market at around 2.4 million units in 2011. Honda Motorcycle and Scooter India (HMSI), with models such as Activa and Dio, have a lion’s share of over 50 per cent in the category. Though Yamaha has scooters such as Neo, Fino, and Spark in its global portfolio which it sells mostly in south-east Asian countries, the company decided to design and develop the Ray specifically for the market in India. Roy Kurian, national business head, Indian Yamaha Motor says, “Unlike in the 1960-1970s, majority of scooters users today are women. When we started developing the product three years back, we realized that there are many products available in the market. Existing products will not do. So our R&D team came down from Japan to design a product which would specifically cater to the needs of the dynamic young Indian woman.” Nearly 30 per cent of the 2.56 million scooters sold in the country are bought by women, the remaining sales come in from products designed for family usage. After three years of developmental work, the Ray was finally introduced with a price tag of Rs 46,000 in Hyderabad in the middle of last month. The company roped in actor Deepika Padukone as brand ambassador and associated itself with Femina Miss India to strengthen brand appeal. Interestingly, in recent times, while two wheeler companies have roped in male actors to promote motorcycle brands, manufacturers have signed on female actors to endorse scooters. Latest in point is Mahindra Two Wheelers who have associated with Kareena Kapoor to generate awareness about the Duro, Rodeo and Flyte. “In the scooter segment, there is not much distinction in the products and technology being offered by the different two-wheeler companies. The companies are therefore trying to innovate on marketing initiatives by roping in brand ambassadors, trying to address specific consumer sets be it working women or urban male buyers or college girls through promotional campaigns”, says V G Ramakrishnan, senior director (automotive practice), Frost & Sullivan. 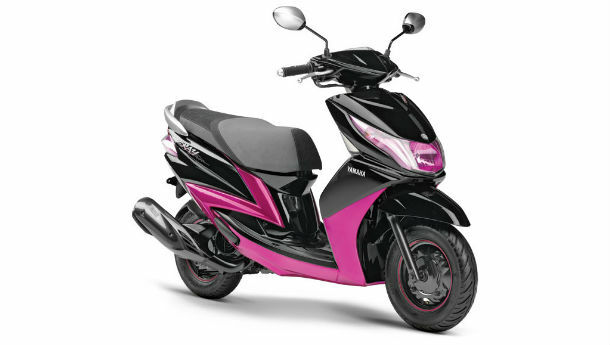 Ramakrishnan’s contention is probably strengthened by the fact that though Yamaha is targeting women in the age group of 16-24 years with the Ray, in the initial round of bookings (7,000 bookings within two weeks of launch), purchase orders were also placed by men who opted for the less ‘ girlish’ colour’. The company is hopeful that it would be hawk at least 45,000-50,000 units before the close of the calendar year. Data available with SIAM show Hero Pleasure sold around 35,000 units every month last year as compared to average monthly sales of over 100,000 units of Honda Activa. Kurian says Yamaha is eyeing a share of 20 per cent in the scooters’ segment by 2016. “We will have production volume of two million units in 2016. Scooters will contribute 30 per cent to our overall sales, the 150 cc models will account for 40 per cent and the remaining numbers will come in from entry-level motorcycles”, Hiroyuki Suzuki, CEO and MD, Indian Yamaha Motor says.